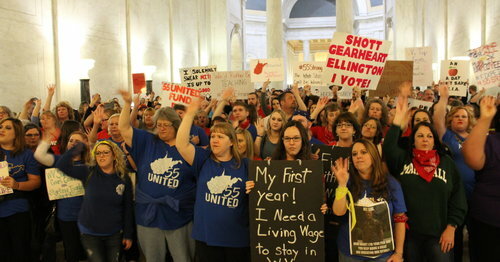 Striking teachers and other public employees in West Virginia have shut down schools across the state for more than a week, flooding the capitol in Charleston each day to rebuke their lawmakers. The workers are demanding significant raises to their stagnant pay and a clear plan to curb rising premiums in the state employee health care program. If only someone could have foreseen such a state of affairs. Instead, lawmakers are staring down budget gaps as they try to resolve a historic strike that has shuttered schools in all 55 counties and galvanized austerity-weary residents. A tentative deal to end the walkout was hatched earlier this week by Republican Gov. Jim Justice, who promised raises of five percent for school personnel and three percent for state employees. But workers doubted lawmakers would follow through on the deal and vowed to continue their walkout. Their skepticism was well-founded. Three days later, the state Senate still hasn’t approved Justice’s proposal. Many lawmakers have doubted the governor’s numbers and questioned whether the money is there for the raises. Although Republicans now control both chambers of the statehouse, the tax cuts that squeezed the state budget were a bipartisan undertaking. Then-Gov. Joe Manchin, a Democrat who’s now one of the state’s two senators in Washington, had urged legislators to pursue the tax cuts in 2006, arguing that West Virginia needed to slash taxes on corporations in order to be competitive with other states. Over the following years, the state wound down its corporate net income tax rate from 9 to 6.5 percent, and phased out its business franchise tax. It also slashed its tax on groceries from six to three percent, and later did away with it entirely under Manchin’s successor, Democrat Earl Ray Tomblin. Over the same span, the state also created a family tax credit, increased its homestead exemption and got rid of an alternative minimum tax and corporate charter tax, according to the West Virginia Center on Budget and Policy. All told, those cuts diminished state revenue by more than $425 million each year, the center estimates. They’re saying we can’t afford it. Well, we can’t afford it because we’ve done these large tax cuts. Much like the Republican leaders who recently fast-tracked federal tax cuts through Congress, West Virginia leaders sought their cuts at a time when their economy was doing relatively well, with strong coal prices. But coal operators got battered by the shale boom and cheap natural gas, driving down demand for coal production. The industry’s travails have closed mines and crimped tax revenue. In the meantime, teachers and other public employees have been asked to tighten their belts. While some teachers have received pay increases based upon length of tenure, the state has not boosted the overall payscale since 2014. West Virginia now ranks 48th out of 50 states and the District of Columbia in teacher pay, according to the National Education Association. The average teacher pay in the state is $45,622, though many educators interviewed over the past week said they earn well below that amount. One teacher, Rebecca Diamond, told HuffPost that she has 19 years on the job and earns just $39,000. She has to work weekend shifts handling a register at Hardee’s for $8.75 an hour in order to support her family. The lack of raises combined with rising health care costs has meant that some workers have watched their take-home pay go down in recent years. Employees have insisted that the state come up with a long-term plan to curb PEIA premium hikes. As of Friday, teachers across the state were still on picket lines and protesting at the state capitol. County by county, they will determine if schools remain closed into next week. So far, not a single one of the state’s 55 counties has reopened its schools ― a clear sign of the strike’s backbone and the pent-up frustration of workers. “If they would have had the revenue from tax cuts and invested in teachers, this would be a different story,” said Boettner.